1. The face is automatically recognized and tracked on the preview image. When the subject's face is found in the image preview window it is dynamically outlined by the yellow frame. The green frame outlines the image area to be cropped. The yellow frame / green frame areas ratio is set via inPhoto ID Canon menu. If the face is located too close to the image frame and the area to be cropped is cut by the image border, the frame color will change from green to red. 2. 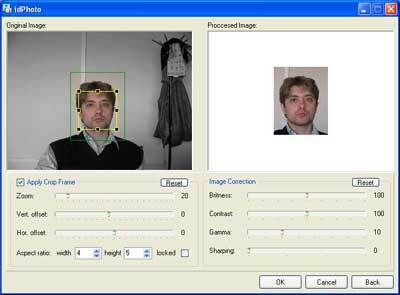 After the image is captured the face can be cropped and the resulting image can be enhanced. Upon pressing the Capture button the Image Processing window will be invoked (this window can be skipped off if the corresponding settings are made in the software options). This window provides an ability to crop the face area (automatically or manually), and enhance the resulting image if necessary. The face area is automatically outlined by the yellow frame. The user can change the frame size and position if necessary. If the face on the image is not recognized automatically the user has an option to outline the image area manually. The green frame outlines the image area to be cropped. The yellow frame / green frame ratio and position are adjusted by Zoom, Vertical offset, and Horizontal offset controls. The aspect ratio control is used to set the resulting image ratio. If the face is located too close to the image frame and the area to be cropped is cut by the image border, the frame color will change from green to red. In this case the user has three options: ignore, modify the image frame, or press Back button and return back to the image preview window. Also, it is possible to adjust image brightness, contrast, gamma, and sharpness using the corresponding controls in the right part of the Image Processing window. Press OK in order to transfer the cropped and enhanced photo to the TWAIN compatible application from which inPhoto ID software has been started up. inPhoto ID options are controlled on the Processing tab of the Options dialogue box. Check Image Processing to enable image processing after capture. Show if necessary: the Image Processing window is displayed when necessary, e.g. when the face is not recognized on the image, when the face is too close to the image frame, etc. 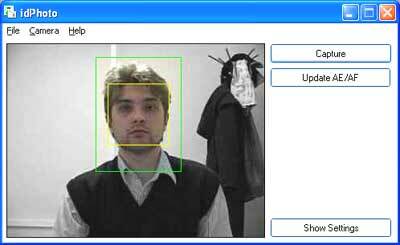 Check Auto Face Detection to activate the automatic face recognition and detection. 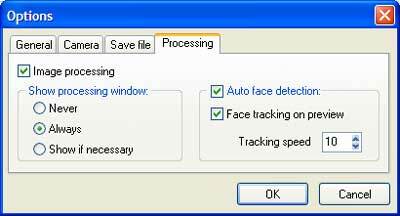 Check Face Tracking on Preview to enable dynamic face detection in the preview window.